It’s getting harder to be a Christian in our post-Christian culture. As a pastor of 35 years, Andy is seeing the church wake from a “Christian Pax Americana” to an era of intensified hostility. 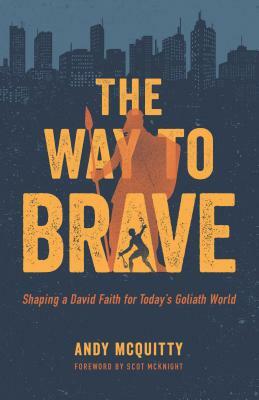 Based on David’s courage before Goliath, The Way to Brave helps readers face the giants looming over us today, such as secularism and relativism. Bent on banishing Christian influence from public life, their power is shocking, their reach expansive, and their deployment quick. But still they are no match for our God. DR. MCQUITTY spent his high school years in Paris, Texas where his father served as Senior Minister of a Presbyterian church. Andy is husband to Alice and father to Julie, Elizabeth, Bonnie, Jonathan and Jeffrey. And most recently, grandpa to Drew and Madeline.Andy is an avid reader, tennis court rat, golfer, and writer; but his favorite pastime is spent with his family.He is a graduate of Wheaton College, Wheaton, Illinois and of Dallas Theological Seminary in Dallas, Texas. Andy earned his Doctor of Ministry degree from Dallas Theological Seminary in 1997, receiving the C. Sumner Wemp Award in personal evangelism as well as the John G. Mitchell Award for outstanding scholarship and effectiveness in ministry.Andy has served as a youth pastor in Washington State, and as Associate Pastor of a Bible Church in Garland, Texas. He has faithfully served as Sr. Pastor to Irving Bible Church since 1987.